Paris, Atelier Luc Lafnet. 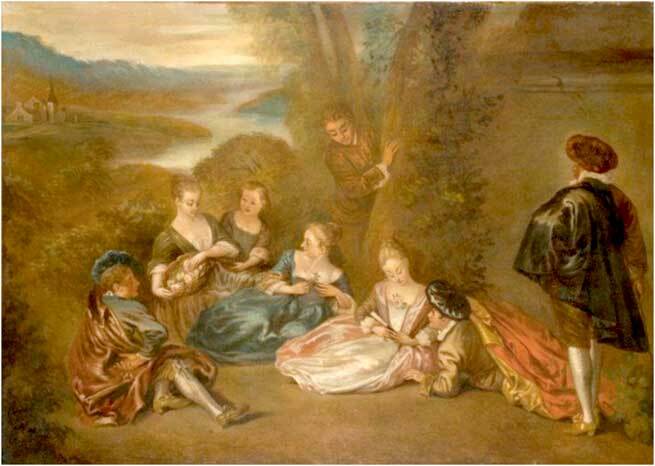 Sale, Paris, Hôtel Drouot (Artcurial), February 6, 2013, lot 265: “ÉCOLE FRANÇAISE DU XVIIIe SIÈCLE / Suiveur de Jean-Antoine Watteau / Assemblée galante dans un paysage / Huile sur toile / 70 x 98 cm (27,30 x 38,22 in.) / 5 000/7 000 € .” Bought in. Anonymous artist, Le Repos sur l'herbe (detail). 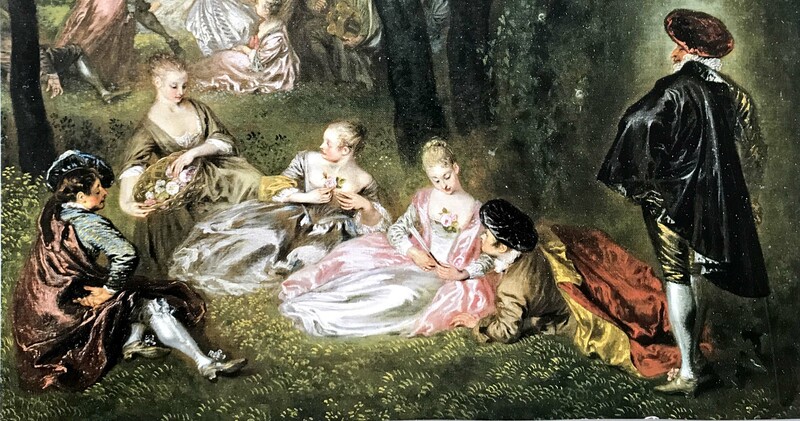 Antoine Watteau, Les Divertissements champêtres (detail). London, Wallace Collection. 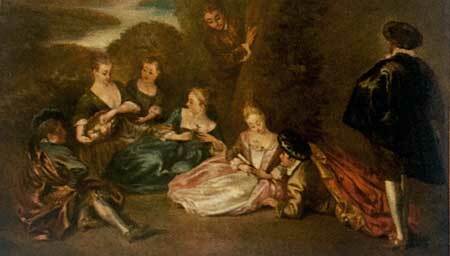 The figures in this painting are largely a quotation of ones seen in Watteau’s Les Divertissements champêtres, now in the Wallace Collection. The major difference is that the copyist has supplemented the group with two additional figures: a child and a young man holding a tree trunk, peering down. Neither seems to be derived directly from Watteau. The landscape opens onto a wide valley with a river running through. While it may suggest Watteau’s idyllic views, his are more finely wrought. This landscape, by contrast, is aligned with the more generalized views that Pater was prone to paint. This picture is clearly not by Watteau, and perhaps not from his era.